There are 3 ways to get to Machu Picchu: through the Inca Trail, with the long route through Hidroeléctrica and by train. If you are not one of the people who enjoy outdoor hiking, you should choose the train ride. The train to Machu Picchu is a beautiful journey through the Sacred Valley of the Incas to Aguas Calientes (Machu Picchu Pueblo), at the foot of the Wonder of the World. Peru Rail or Inca Rail – Which one to choose to travel by train to Machu Picchu? How long does it take to travel by train to Machu Picchu? How much does the train to Machu Picchu cost? How is the train trip to Machu Picchu? To get to Machu Picchu by train you must book tickets online in advance. It is recommended to do it immediately after knowing the date of visit to the Wonder of the World. Once in the city of Cusco (Peru), the visitor should approach the chosen train station (station Poroy, Urubamba or Ollantaytambo). It is advised to be 30 minutes before the scheduled travel time. All the train services have as final destination, the town of Aguas Calientes (Machu Picchu Pueblo). From there you only have to board one of the buses that take you to the Machu Picchu gate in about 30 minutes. To book train tickets you must enter the website of the only 2 companies that provide the service: Peru Rail or Inca Rail. It is important to make the reservation as soon as you know the date of entry to Machu Picchu. The tickets are as much in demand as the tickets to the Wonder of the World. There are two companies with authorization to travel the train tracks to Machu Picchu. Peru Rail has 4 different quality services: Vistadome trains, Expedition, Sacred Valley and the Hiram Bingham luxury train. Inca Rail has 4 different services: The Voyager, The 360º, The First Class and The Private ..
Belmond Hiram Bingham: It is one of the most luxurious trains in the world, exclusive and with service on board. It has 4 choches, dining car, car bar, gourmet dinner, transportation and tickets Machu Picchu. The Private: With capacity for 8 people. The car, known as the ‘Princess Inca’ is of the presidential class. The car has many details in its decoration, food on board, free bar. This train operates only by request. There are 3 boarding stations for the one-way trains. There is only one station to board the return train. Ollantaytambo station: Av. Ferrocarril s/n, Ollantaytambo, Valle Sagrado (Cusco). Urubamba station: Av. Ferrocarril s/n, Urubamba, Valle Sagrado (Cusco). Aguas Calientes Station: Machu Picchu Pueblo, s / n, Las Orquídeas Neighborhood (next to the Artisan Market of Aguas Calientes). There is another Peru Rail train station located next to the hydroelectric plant. Getting there is possible through the long route to Machu Picchu by Santa Maria. 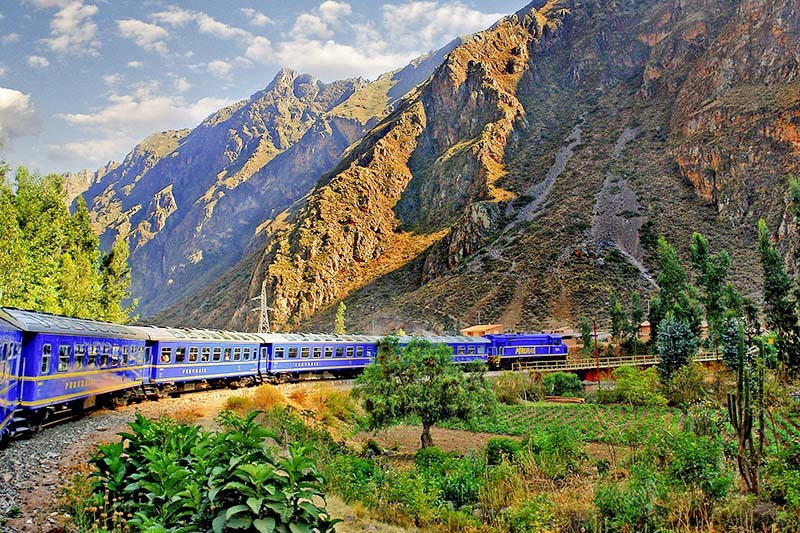 In most cases, you will board your train to Machu Picchu at the Ollantaytambo station. The Poroy station is restricted for safety during the rainy season (November to March). The place where all the trains arrive is the station of Aguas Calientes (Machu Picchu pueblo). One block from the train station you can board the buses to Machu Picchu. They leave every 15 minutes and the box office is right in front. Train schedules are fixed and punctual. Most services depart from the ‘Ollantaytambo’ station. The prices of the trains depend on the type of service. The amount tends to increase the closer the date of the trip. The train ticket to Machu Picchu has discounts for children under 3 years. 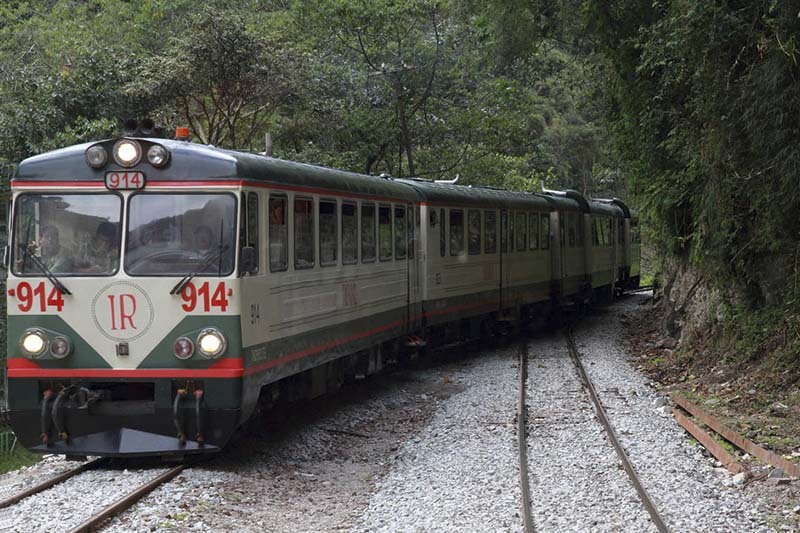 Peru Rail offers free admission to children under 3 years of age. They must travel charged by their parents. Inca Rail also allows free entry for children from 0 to 2 years of age traveling in the parent’s or guardian’s seat. Peru Rail offers a 50% discount to children under 12 years old. Inca Rail also has a 50% discount for children from 3 to 12 years old. The distance from Poroy station (Cusco) to Aguas Calientes is approximately 65.8 kilometers. The route crosses the beautiful landscapes of the Sacred Valley of the Incas. The trip takes 3 hours and 15 minutes approximately. The distance from the Ollantaytambo station to Aguas Calientes is approximately 30.5 kilometers. 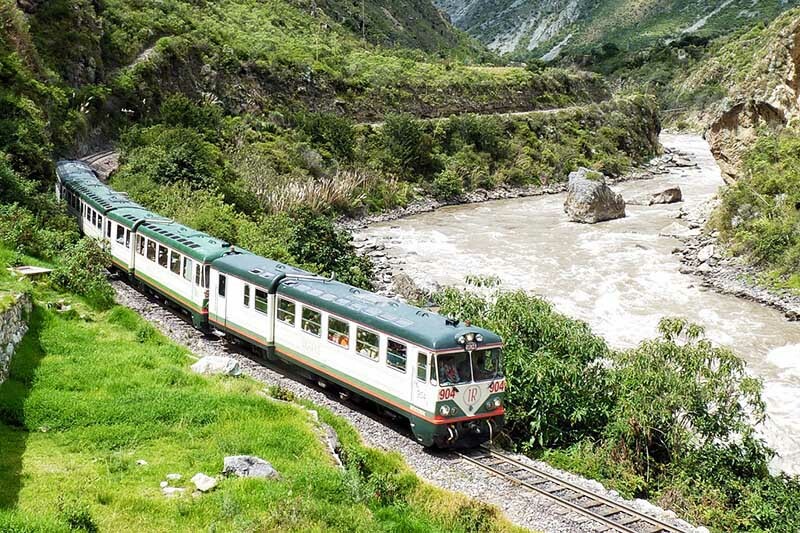 The train runs through the beautiful and green Sacred Valley of the Incas along the banks of the Urubamba River. The trip lasts a little less than 2 hours. The train ride is magical because you will travel with a large group of people from all over the world excited to be so close to Machu Picchu.